Many regular readers will be well aware of the exceptional tome that is Exploring Midsomer: The Towns and Village at the Murderous Heart of Midsomer. This hugely popular book, written by Chris Behan, was a guide to some of the towns and villages that feature in the show. Now the wait for a sequel is finally over. It’s called Roaming Midsomer and it’s a compilation of interesting walks and places to eat throughout the Midsomer region. The book covers a lot of the scenery that might be familiar to viewers of the show but provides an in depth look providing lots more detail and fascinating facts. This time Chris, a local resident and photographer, has teamed up with Martin Andrew, a walking aficionado to explore Midsomer. The book aims to take readers on a tour of the real places behind the programme, and would make a valuable addition to the libraries of programme fans and lovers of the South Oxfordshire and Buckinghamshire countryside. Capturing the charm of all the towns and villages featured, far beyond the quick glimpses we get in the background of the show, Chris and Martin call upon their vast local knowledge of the area as both men have lived here for decades. So you’re in safe hands. As well as that, there are nearly 200 photos, expertly taken by Chris to show the area at its very best. And helpfully, the book is divided into handy chapters depending on what kind of outing you’re after. It’s the perfect guide and companion to exploring one of the country’s most beautiful regions. Chris, of course, has his previous Midsomer book under his belt but Martin is an established writer too. He has written 50 Walks in Hertfordshire for Automobile Association (AA) Books and a Collins’ Ramblers Guide for Harper Collins, among others. 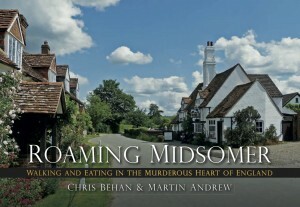 The new book Roaming Midsomer, like the original Exploring Midsomer, is available online and from selected bookshops acrosss the area priced around £12.50. It will make the perfect present and a great companion for anyone wanting to explore this gorgeous area of British countryside. Chris kindly allows us to use a photographs from his original book on the home page – to illustrate the area more than words can. 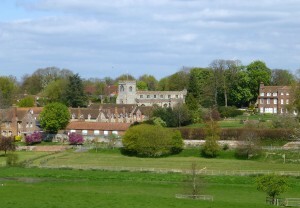 Now Roaming Midsomer enables a deeper exploration, with suggestions and ideas for things to do while you’re here. Midsummer seems like the best place for anyone to live. I am mesmerized by its beauty, closeness and tranquility. I wish I were living there. I adore Midsomer Murders, and have watched ithe series several times. With hat pins and poisons, the witty ways the British murder beats the American way hands down! The characters are wonderful, the scenery divine and the attention to detail is of movie quality. I would love to take the Midsomer tour!